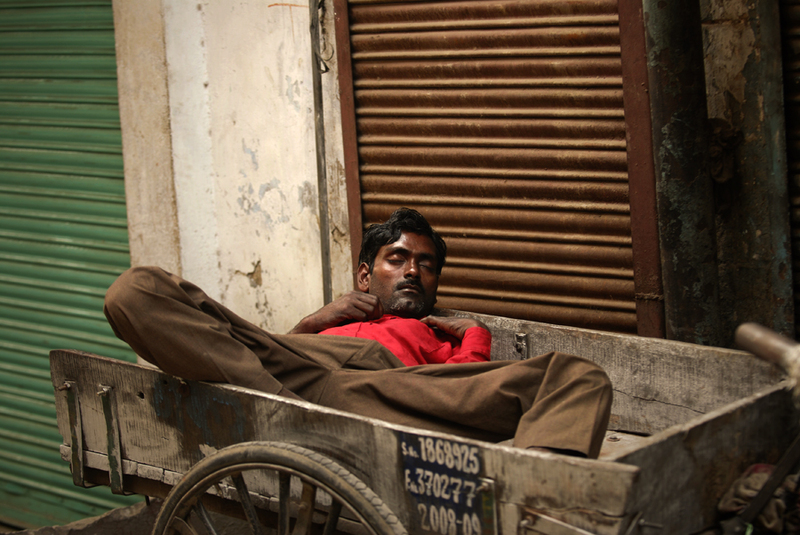 In this fifty-seventh archive story by Kristian Bertel, we meet a sleeping man in the Nawab Ganj area of Delhi in India. Almost everyone suffers a cultural shock in India. Because of the "differentness" of the country is not surprising. But whoever is serious about understanding and at least knows some of the most important differences, will also be able to more easily discover the beauty of India behind superficial chaos. Despite many problems and negative headlines, the country is still a very popular destination. India is popular which is not only related to the fact that you can travel very cheaply in India. In hardly any other country can you experience such incredible stories as in the huge improvisational theater in India. India is also crazy, colorful spectrum of different religions, cultures and traditions. Traveling in India has many faces but unfortunately also shadows. This India, in all its contrast, with all its contradictions, has also been experienced and felt by Kristian Bertel. In 2008 the photographer was there for the first time and he was so overwhelmed that he had traveled to the country again in the coming years to push the camera button in in more cities. The result is a highly unusual performance called 'India', which relies entirely on the power of his photos and therefore with the his photographs from India. From the snake charms and grandmother portraits with the radiant eyes, from which sorrow and love, curiosity and pride spray. From street scenes, which show the plentiful Indian life, garbage and misery included, without however deter. From deserted cities and landscapes, which, with their soft coloring, look like paintings and yet are anything but a picture perfect. From piles of fire and public toilets, where one would like to keep a nasal reflex. Going around in the Nawab Ganj area of Delhi was a task for all the senses. "- Capturing odors in photos is almost impossible, but that did not prevent me from trying to do it, and in some pictures I even succeeded", the photographer says." As a photographer and traveler in Delhi you will see people sleeping in the streets. Rarely has sceneries of such power and magic been seen across India. They may disturb the traveler on one hand, and yet, on the other hand, they are marvelously beautiful. Because the photographs by the photographer are ruthlessly direct, but on the other always respectful, because they do not expose the person concerned. Which would lead one to the opposite topic of the theme. The photographs as the one portrayed above are a common thread not only throughout India, but also through the all his slideshows. And interestingly also by the photographer's travel behavior. In contrast to his usual travel practice, he regularly took to the juice bottle in India. Before and after each meal he took a sip of mango juice, which was a somewhat habituation-needy procedure, since otherwise it does not occur that we to start our day with juice at five o'clock in the morning, according to which each coin has two sides  for dogs in front of a thousand mirrors as well as for photographers with respect to Indian bacteria. Contradictions are the main theme. Taking the attention of the Indians is impossible. Being a foreigner in Delhi is always the focus of interest. You will be gazed at, and you will be laughed and whispered and, of course, photographed. What is understood in Europe as an unpleasant encroachment on privacy is completely normal in India. In the vast majority of cases, it does not remain in the distance from observation, but you are also overwhelmed with questions. While you are being plagued at a point with nerve-racking selling tactics, you have to shake off a particularly stubborn persecutor at the next street corner. "Where are you from?" "How do you? ", "Please take a look? ", "One Rupee please! ", "Hello, Sir! ", "Which country?". This undivided attention can be very exhausting for the traveler, especially if you really want to have your peace. How you react depends on the situation. A friendly response is often seen as an invitation to insist even further. Ignoring is actually countering our sense of courtesy and requires a bit of practice as well as a sufficiently thick coat but often proves to be the best strategy to make its way. "- India is as diverse as I have never seen it before in another country. Although the experience of living in Delhi will remain unique, I still have some experiences with the country of India. Ambivalence, enthusiasm, color diversity, chaos and street cows", the photographer says. India is a land full of stories. On every street, on every corner and in the many places in India, life is rushing by you as a photographer with millions of stories to be told. In the archive story above, you hopefully had a readable insight in the story that was behind the photo of a sleeping man in the Nawab Ganj are of Delhi. On this website of Kristian Bertel | Photography you can find numerous travel pictures from the photographer. Stories and moments that tell the travel stories of how the photographer captured the specific scene that you see in the picture. The photographer's images have a story behind them, images that all are taken from around India throughout his photo journeys. The archive stories delve into Kristian's personal archive to reveal never-before-seen, including portraits and landscapes beautifully produced snapshots from various travel assignments. The archive is so-far organized into photo stories, this one included, each brought to life by narrative text and full-color photos. Together, these fascinating stories tell a story about the life in India. India, the motherland to many people around the world, a land of unforgetable travel moments. The archive takes viewers on a spectacular visual journey through some of the most stunning photographs to be found in the photographer's archive collection. The photographer culled the images to reflect the many variations on the universal theme of beauty and everyday life in India. By adding these back stories the photographer's work might immensely enhanced the understanding of the photographs.